A sandy setting perfect for summer featuring new items and textiles. For a light summery table start off with a neutral tablecloth and add pops of color with napkins and flowers. The new Garnier-Thiebaut coated fabric in Mille Azulejos Naturel provides a casual look ideal for outdoor gatherings. Add the Jars dinnerware collection in Nacre for a coastal vibe. This Match Pewter tulip wine glass is just right for serving sangria. The pewter stem adds interest and old world elegance to the table. The bamboo flatware collection from Sabre Paris adds a wonderful, organic texture to your table. Both playful and exotic, these handles make a statement while keeping it light. 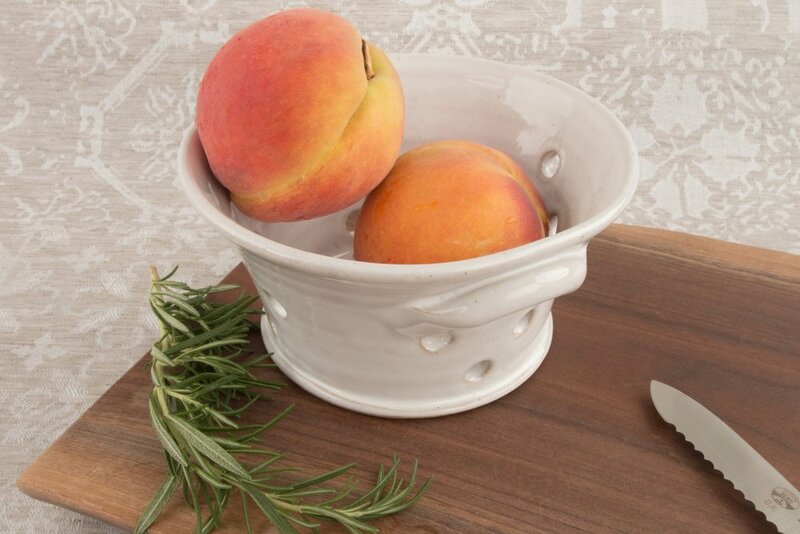 Add some farmhouse charm with the newest addition to the Farmhouse Pottery collection, a ceramic strainer that is great for washing berries and displaying fruit. Dress your napkins with a handmade Spencer Peterman napkin ring. Crafted sustainably from fallen trees, each piece is unique and will add a natural accent to your table setting. We love sharing our tabletop designs. We hope you find inspiration in out post and if you have any comments, questions or ideas, let us know below. Find these and other items online at Didriks.com or in store at our Belmont and Newlton Lower Falls locations.